Revived Treasures further celebrates Hemmerle's 125th anniversary in 2018. Layered with cultural and historical references, this new body of work pays homage to Egyptian civilisation. A thread of continuity from ancient to contemporary is weaved as Egyptian faience finds new homes in Hemmerle’s designs and motifs such as lotus flowers, gods and temples appear in new creations. A set of faience from 664-332 BC, known as the the Late Period of ancient Egypt, represents the Sons of Horus, a group of gods in Egyptian religion who were the personifications of the Canopic jars which accompanied one on a journey to the afterlife. Framed within temple-like structures made in bronze and studded with diamonds, these gods can be admired face to face in a pair of earrings or in the cap, the ends of a cuff in various hues of yellow, green, blue and purple beads of peridot, smoky quartz, rock crystal, carnelian and jade. "All art has been contemporary"
Jewellery carried a profound significance in Ancient Egyptian culture not only as adornment but also as a symbol of protection, revered for its power and sacred symbols and stories. Yasmin Hemmerle is Egyptian and the Hemmerles have long been mesmerized by the country’s unrivalled firmament of historic sites jewelled with pyramids and dazzling colour. With unique colourings that show the traces of time, these triad amulets from around 747 – 30 BC, The Late Period, show three deities from the Osiride myth; Horus as child stands between his mother Isis and her sister Nephthys, all holding hands. Widely considered the most important amulet in ancient Egypt, sacred scarabs were made in the shape of the beetle which was personified by Khepri, a sun god associated with resurrection. An important source of information for archaeologists, today they represent a significant body of ancient art. Created between 1350 – 1000 BC, The New Kingdom and Third Intermediate Period. 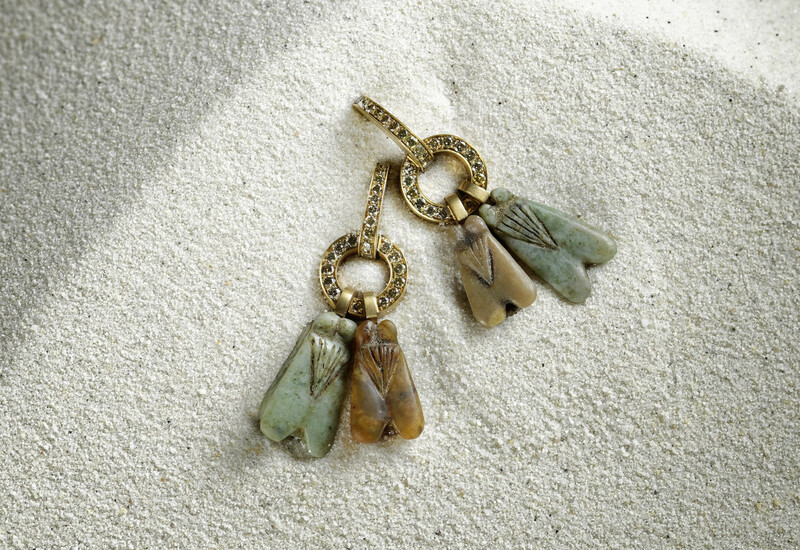 The scarabs used in these earrings are engraved on the reverse with hieroglyphics layered with symbolic meanings. This faience from 18th dynasty ancient Egypt, The Amarna Period, 1352 – 1336 BC, is returned to its original purpose in a necklace featuring a striking emerald and sapphires hung on a flexible strap of hand-hewn agate beads knitted in the round over silk. The ceramic is inspired by the symbolic lotus flower with a matrix of a white faience inlaid with turquoise and blue petals, yellow stamens and a red calyx. At the top, the six perforations that would have held strands of beads are still visible.